Whether it's a group retreat or conference, a private time of "re-creation" for yourself, or a family get-away, Liebenzell welcomes you. Smaller groups and individuals will find the North Campus on Heath Lane perfect for time away to be physically and spiritually renewed. Our North Camps offers . . .
Clean, comfortable rooms with linens provided. Buffet dinning available each day, for groups of 15 or more. A variety of meeting rooms with audio/video equipment and electronic pianos. Lots of space to get away from it all. Various kinds of wildlife which share this land with us and add to its charm. Staff with a servants' hearts to make your stay here a truly enjoyable one. A place to truly have that 'mountain top' experience of "Bringing Hearts to God". 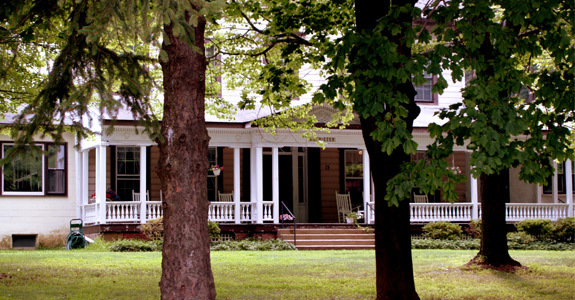 The Schooleys Mountain Retreat Center North Campus is located at 13 Heath Lane, in Washington Township, Morris County, N.J. Please note: This is not our mailing address Do not mail to this address. Schooleys Mountain, North Campus offers competitive rates for your personal or church retreat. All packages include use of the Guest House grounds and facilities.